The Douze F1 (now called F10) is the best bike purchase I have ever made. Our lives as parents are immeasurably enhanced by it. It is fantastic fun, nimble and handsome, very high quality and excellent value (though far from cheap). 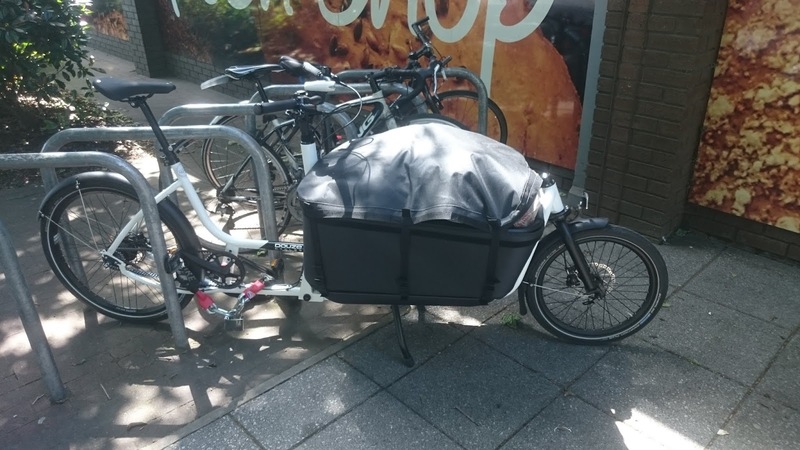 Why buy a family cargo bike? We bought a cargo bike so that we could continue to cycle together after having a baby. We wanted to cycle around London and we wanted to mooch the five miles to the beach when on holiday in Normandy. As a cyclist and a prospective parent I feared shrinking horizons and multiplying hassles. I felt that my sense of self might not survive pushing a buggy. I hoped that a cargo bike would allow us to dodge much of the drudgery of parenthood whilst opening up more of the joys. Happily, I was right. 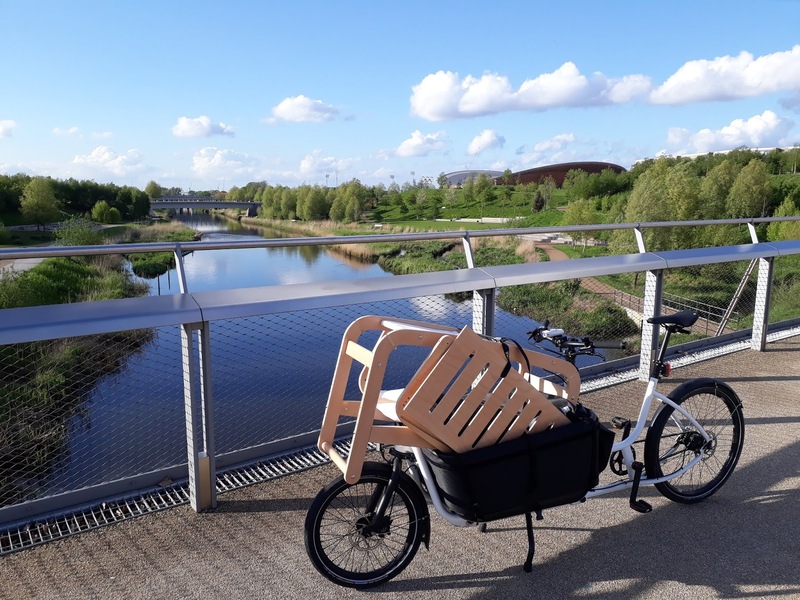 With a cargo bike every journey becomes a lark. Our choice of destinations exploded from the three or four generic, more-or-less squalid local parks to dozens of green, open spheres for adventure. 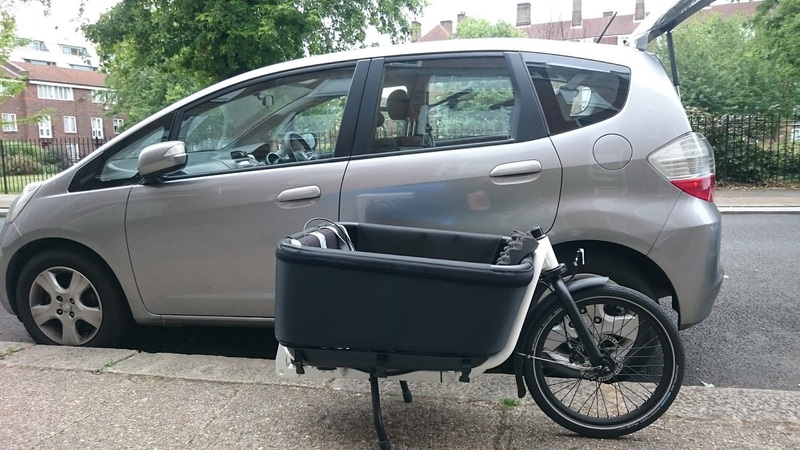 There are alternatives to a cargo bike and they are much cheaper. A trailer seems a good idea but I wanted to be able to watch my child’s reaction to the world. 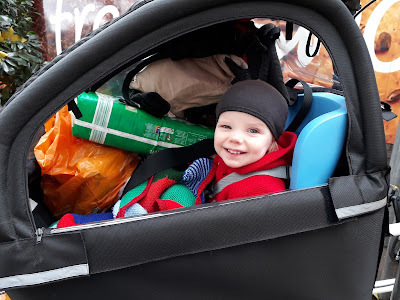 A bike-mounted child-seat is no good before eight months and we were uncomfortable with the top-heavy feel at standstill. In most child seats the view for the child is not the world going by but rather the small of their mum's back. Friends report that their children are promptly bored and asleep. Once set on getting a cargo bike, you need to decide what to go for. We have owned our Douze F1 Standard for 20 months now, riding it well over 2000 kilometres in all weathers. We use it every day and it is pivotal to the vast majority of our outings and adventures. Room for two children up so six or seven years old. Relatively light and nimble. Fast and able to cover decent distances (on the Voies Vertes of Normandy). Familiar geometry: more like a conventional mountain-bike or commuter bike than an upright Dutch bike. Transportable to France for annual summer holidays. Disc brakes, hub gears and belt drive. 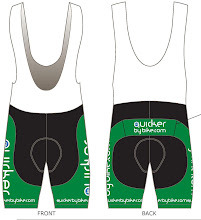 (Because these make for hassle-free bikes). So there was only one choice. This is what I think of it. I bought our bike from the helpful chaps at London Green Cycles when my son was a month old. I have suffered Buyer's Remorse after most of my bike purchases but, despite the high price-tag, I have only ever felt right about this purchase. In a cargo bike two children can chat together in their own space, they have an unimpeded view of the world and you can see them. You can even reach down and ruffle their hair if you want to. Holiday beach trip. Without the Douze we would have had to drive. If the Douze has a weakness it is in its outright capacity to carry children. 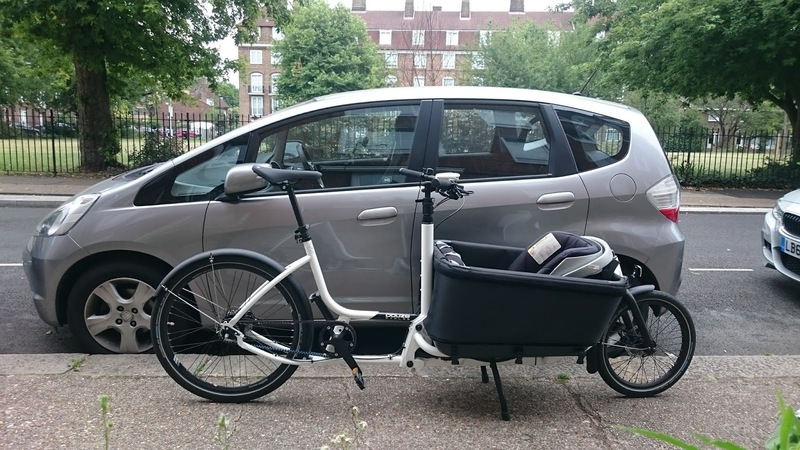 Whilst it is excellent for carrying two children up to about six years old, the capacity is significantly smaller than that of other family-orientated cargo bikes. If big capacity is your priority over weight and speed then there are more practical bikes available like the Bakfiets Cargo Bike Long. I should point out that we have the "standard" 600mm long box. There is an extra-long box (800mm) that would give more room. However even with this extra space, the Douze is altogether a different beast to a Bakfiets. Children sitting on the bench in a Bakfiets have their legs dangling below them. In the Douze they are sitting on the floor (on a low bench/cushion). 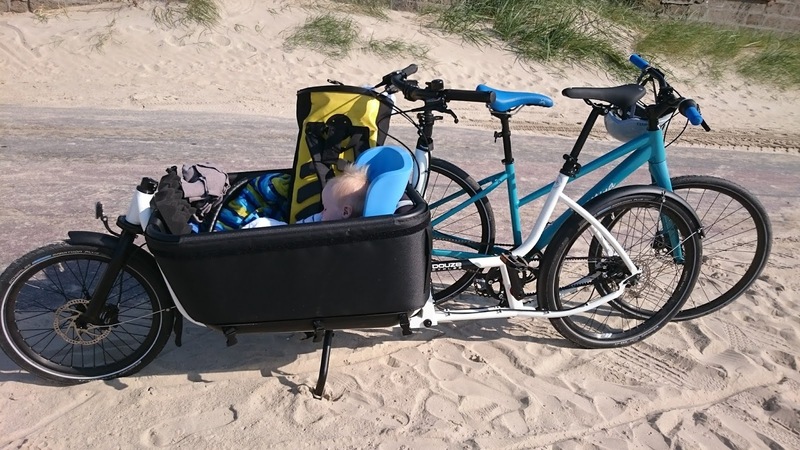 Nevertheless, we expect to be using the Douze to carry children up until the age of six or seven, even if in the later years it’s only for mid-ride-tantrum back-up. Our son was in the Douze from six weeks old. In the early days we simply strapped the child car seat in. Beware that with the Douze a car seat takes up ALL the space in the bike. At nine months he was out onto a Babboe toddler seat and since he was eighteen months he has been sitting on the bench where he is happy and feels at-home. We are four now and I have bought the Melia baby seat so that both children can be in the bike. Two children over 18 months just sit side-by side on the bench and there's a bit of room at their feet for other stuff. As reassurance on the capacity to carry children: I have had an eight and a six-year old on the bench together for a short ride with no problem. Friends had a go with our Douze and promptly bought one to transport their children who were already 4 and 6. They get a lot of use out of it. 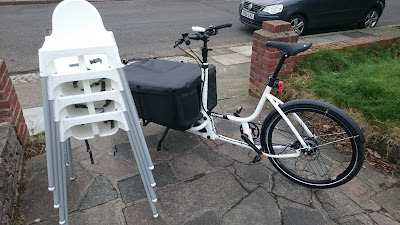 I have added a rack to the back of the bike so that we can carry stuff in panniers this summer. 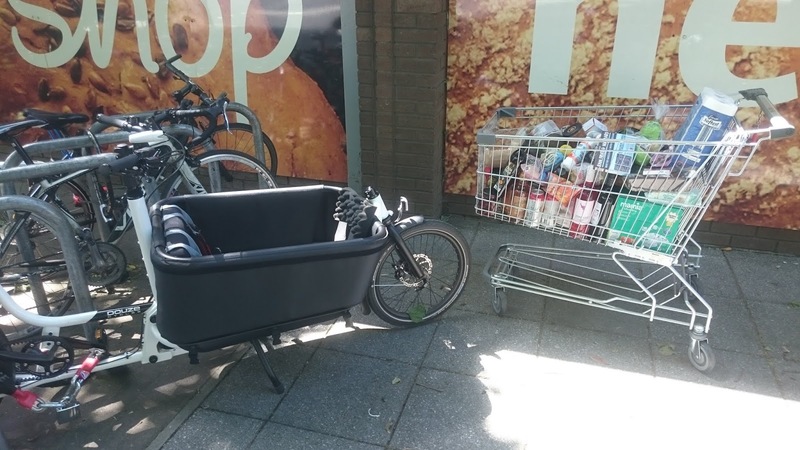 If you had a Bakfiets you would just chuck your baguettes, buckets and spades in the box with your two children: loads of room. But then you wouldn't have your Bakfiets on holiday in France unless you rode it there. The F1 comes with a canopy to keep the winter weather off the children and it has been excellent. It’s robust and clever. My niggle would be with the zips, which are not sufficiently robust. The canopy feels as though it would last a decade of regular use but the zips will have given up the ghost before that. The structure of the canopy is two semi-rigid bars that go from front to back. These are in fact inflatable with a bike pump. Clever and, being a Douze, obviously solid and effective. Packing the canopy away (if you live in a little flat like we do) is therefore very easy. It seems a shame to have the canopy on as it doesn’t really rain much. However the front, side and rear panels all roll up and can be fixed out of the way, so in fact it’s fine to leave the canopy on in case of the odd shower. Throughout the summer it lives in the cupboard. I have spent a big chunk of my disposable income over the last two decades on bikes but the Douze is the most Gucci of all. Like the Brompton, everything has been thoroughly thought through and nothing is out of place. Every weld is neat. Cable routings are clever and tidy. Components have obviously been chosen for their longevity and for their simple style. The paintwork is silky-smooth and shrugs off the occasional clouts I give it with the security chain. I chose the cheaper Tektro brakes (Magura is the Gucci option) and they are excellent. Hydraulic disc brakes are so effective and so low-maintenance that I would be peeved not to have them. Shimano Alfine hub gears were exactly what I wanted for the Douze. I’ve ridden it up some decent hills (Greenwich / Dulwich) without difficulty. I don’t run out of gears on the flat (sensibly speaking). I have had Shimano Alfine hubs on two commuter bikes, each of which did over 10000 kilometres in all weathers before they moved on (one stolen, one sold). I never maintained them. They are silent, reliable and easy-to-tune. You can change gear at standstill. They’re a bit heavy but on a cargo bike that’s not critical. The range of gears on the Alfine is roughly equivalent to a standard road bike. Belt drive is a fantastic addition. It will do 4500 miles without maintenance. It is not oily. It does not squeak. It does not stretch. When my toddler son inevitably grabbed it I was relaxed. The mudguards on the Douze are solid and neat. However, the front mudguard isn’t long enough and the underside of the frame gets splattered in the wet. I have added an sks mudflap and the Douze is UK-ready. 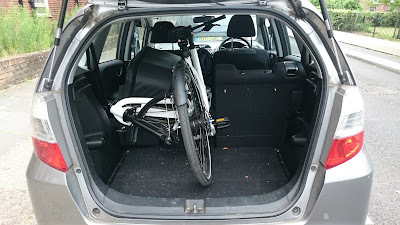 The geometry of the Douze is much the same as a mountain bike or a hybrid so riding it uses the same muscles I'm used to using and I am comfortable over long-ish distances. Bakfiets, Babboe and Urban Arrow are more dutch in their geometry meaning that "pottering" is your only choice of pace. My wife has quite a short reach but rides the Douze comfortably. It’s super-easy to raise and lower both the saddle and the handlebars (both quick-release). The Douze is a lot of fun to ride. It’s very easy to mooch about gently while the children stare about them. But I have also on occasion ridden it hard for thirty kilometres or so, usually for time-constrained ebay purchase collections across London. Ridden briskly the Douze feels fast and nimble. It’s a hoot. It's worth pointing out that the Douze weighs 25 kilos. Cargo bikes are typically closer to the 45kg mark. The centre of gravity is very low, so the bike always feels stable no mater how much you load it. The turning circle is very tight. In fact the turning radius is the length of the bike. You won’t think this is relevant until you try to negotiate cycle-path barriers or the ramp onto a footbridge. This is one of the features that sets the Douze apart. I was a little skeptical about the cable steering but I’m utterly convinced now. The bike feels weird to steer for thirty seconds, as all cargo bikes must, but after that it’s intuitive. 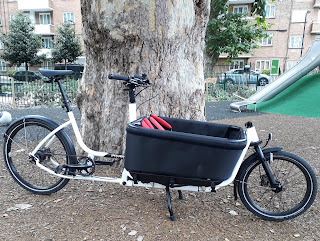 My Bakfiets-owning (and adoring) friend commented on how smooth the steering was on the Douze. I haven’t made any effort to maintain it yet and is hasn’t needed it. A shopping trolley’s worth of food. This had me worried at first. Easy. I then cycled 15 miles home. Across London to collect a cot. All alternative ways to run this errand are unthinkable. Hours sat in traffic or manhandling this lot on the tube. 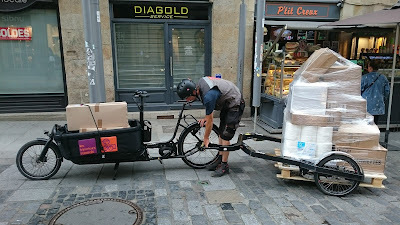 Whilst on holiday in France I was delighted to see a Douze working hard as a courier bike. You know your bike is built to last if a professional uses it. Hard-working Douze in Rennes, France. 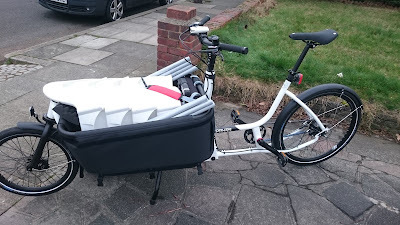 If any single feature sets the Douze apart when choosing a cargo bike, it’s this. You can split it in half in two minutes. 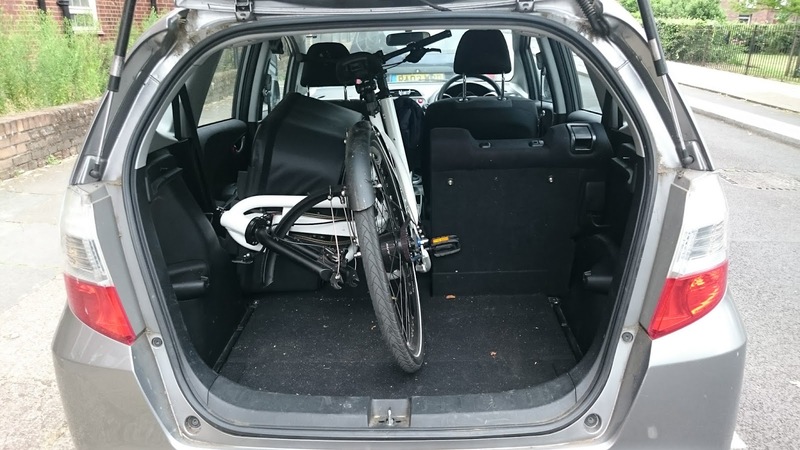 I can cycle up to my little Honda Jazz and have the Douze loaded into the back (with a seat still up for the baby) within five minutes. The Jazz is unusually clever and spacious but I would be confident of getting the Douze into most hatchbacks. A friend asked whether the separation/joining was so slick that you could break it after every journey to store it inside your house. It isn’t far off but on balance I would say that it’s just enough hassle that you would sometimes choose not to take the bike, which would be a shame. The connection between the front and rear is reassuringly chunky. As you offer the back of the bike into the front it slides neatly and positively into place such that you know you’ve got it right and you know it’s absolutely solid. I am confident of repeating this operation a few hundred times with the same experience. Bike in. Seat still up for child. You would do well to ignore this section. In the world of road bikes people are forever talking about how stiff frames are. That’s because it affects feel and handling. A bike is really a beam spanning between two wheels. Cargo bikes are long spans with heavy loads so you need a stiff beam. Deep beams are stiff beams. 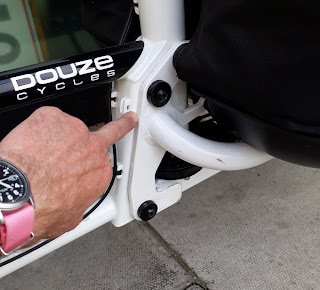 The Douze is the deepest beam I’ve seen on a cargo bike. 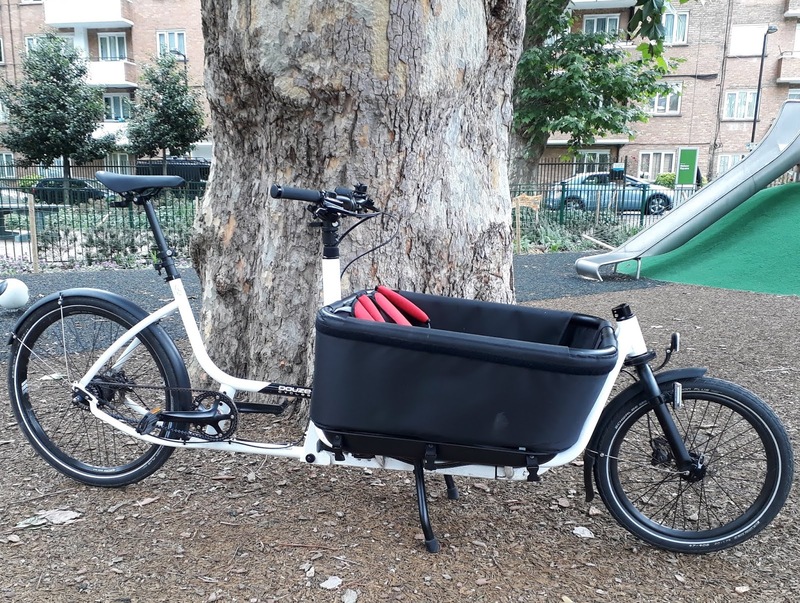 Whilst the beam on the Bakfiets, the Bullitt and the Urban Arrow is a single section of tube or box running front-to-back, the beam on the Douze is a sort of truss made up of multiple sections of tube. Vertically therefore the Douze is very stiff indeed. Fill the bike with a shopping-trolley full of groceries and set off. If you hit a bump in the road whilst riding in a straight line the Douze feels completely inflexible, which is excellent. 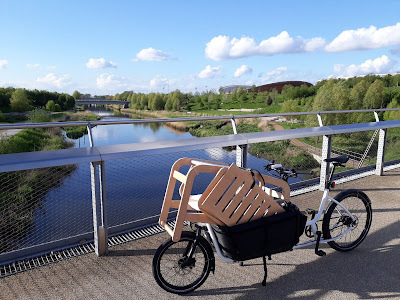 The advantage of the single section, wide diameter beams on the Bakfiets, Urban Arrow and Bullitt is that they are just as stiff side-to-side as they are vertically. Though the Douze is very stiff vertically, it is less so from side-to-side because the tubes that make up the little truss are relatively narrow. With your Douze full of heavy shopping again, hit that same bump whilst going round a corner and you will feel the frame deflect sideways slightly. Does this ever matter? No. Seriously, you will struggle to notice it in almost all circumstances. Geometry much like a regular hybrid or mountain bike. Goes in the back of a hatch-back. Low maintenance hub gear, disc brakes, belt drive. Get on, ride, repeat. Limited to two children up to perhaps six years old. Zips on the canopy could be more robust. Needs a mud-flap on the front to keep the bike clean. Laterally not as stiff others, notably the Bullitt. Great review, very informative. We saw the Douze in April at VeloBerlin and were impressed. Obviously, well thought out by designers that understand the use. For those in hilly cities, the Douze can be had with the Brose e-assist systems, which is considered one of the best. I did have a city bike with an Alfine 11-speed and the seals gave out at about 1,500 km, leaking all the oil out. So something to be mindful of. Hello. I'm sorry, I have only just seen this. Thank you for replying. I love the Bullitt and always hankered after one. 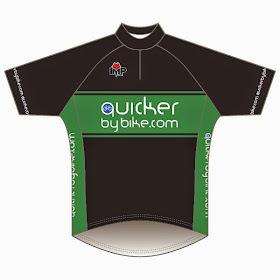 We see lots of couriers with them in London. Handsome bike. Your grandchildren are lucky. But it's not really about them is it! For me the Douze is fun for ME. I know what you mean about the Alfine 11. The more oil you put in, the more comes out. Messy. So I stopped putting oil in. I rode it for 10,000km before selling. Now we only have Alfine 8 (one the Douze and one other) and these do not leak since they are lived with grease rather than oil. I doubt I will ever have them serviced and I bet they will never go wrong. When my local bike shop replaced the seals in my leaking Alfine 11-speed IGH, the bike mechanic grumbled about Shimano's use of oil for lubrication. He lubed the hub with grease prior to re-assembly. Since then, the hub has worked fine.